Koh Samui, the second largest of Thailand’s island, is a tropical haven with something for everyone. For culture buffs, there are stunning temples to be explored; nature-lovers, you are conveniently situated to discover the wonders of Mu Ko Ang Thong National Marine Park; fans of all things water-based, you can scuba dive in the sea in the morning and bathe in a waterfall in the afternoon; for those who just want to relax, there are endless beaches to sunbathe on and many spas to choose from. Whatever your interests are, the island is certain to charm you and leave its impression. Hin Ta (Grandfather) and Hin Yai (Grandma) are intriguing rock formations found on a beach on the southeast of the island that resemble male and female genitalia. 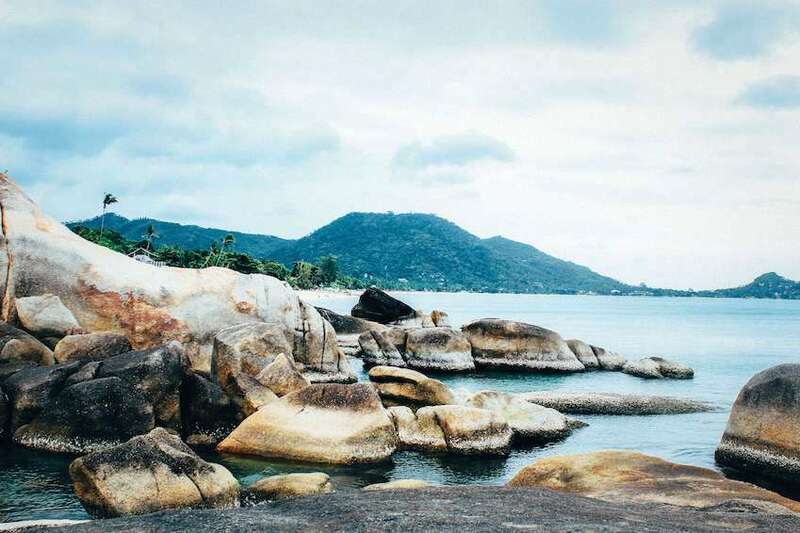 Common folklore surrounding the rocks tells that a couple, Ta Kreng and Yai Riem, were in a boat in the middle of a storm, on their way to ask for the hand of the daughter of a man on the island, on behalf of their son. They perished at sea and instead turned to stone in proof of their intentions. As well as the humorous natural sculptures, the scenery in this area is absolutely stunning. From the rocks the clarity of the water beneath you is so great that you can observe the colourful marine life without even getting wet. 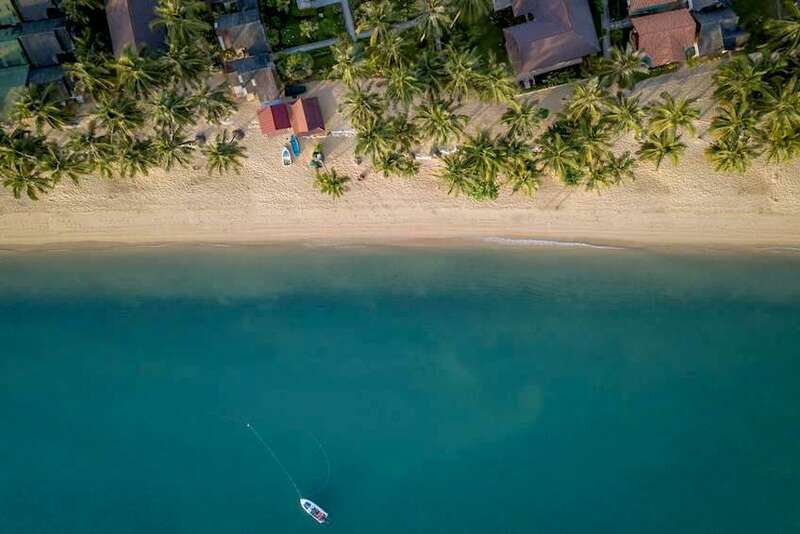 There is also the nearby fishing village of Hua Thanon, which has beautiful green buffalo fields and plantations for an insight into traditional island life. From natural sculptures to man made statues; called by many names, Namtok Tamin, the Magic Garden, Secret Garden, Secret Buddha Garden or Heaven’s Garden is a labour of love from Nim Thongsuk, a local market gardener. From 1976 at the age of 76 until his death at the age of 91, he carefully and thoughtfully positioned many statues in his lush garden amidst the rainforest, opening his family garden to the public upon retirement. The statues range from animals to humans to deities in an assortment of poses within a magical, moss-covered green landscape, the sound of the nearby waterfall a soothing backdrop. One of the most unique and rare experiences, however, is to see a mummified monk. At Wat Khunaram, the mummified body of Loung Pordaeng is on display inside a glass case amidst offerings, incense and flowers. It is said that Khunaram predicted his own death, and at the age of 79 he died whilst in the meditating position. It was his wish to be placed in a glass casket if his body were not to decay, to inspire future generations to follow Buddha’s teachings. Here death is merely seen as what happens before being reborn in the next life. Wat Khunaram is just one of the many beautiful and fascinating temples on Koh Samui. 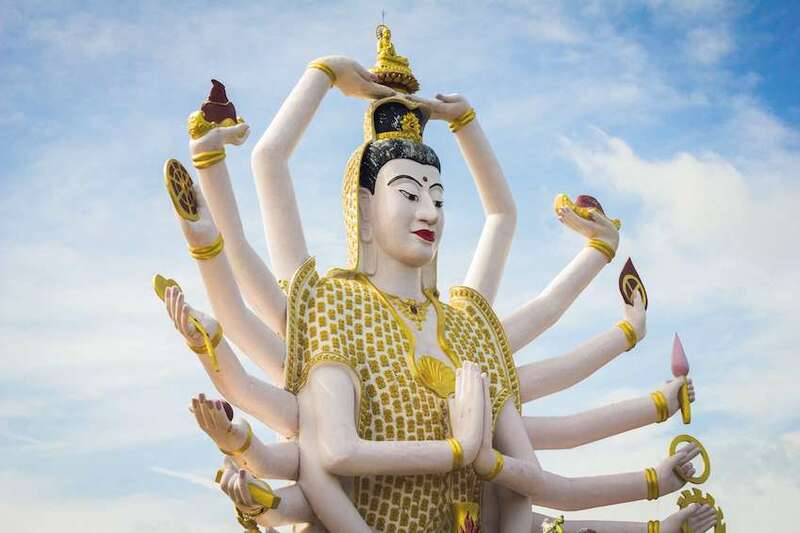 Wat Plai Laem, on the northeastern coast, is another that is particularly vibrant, with an incredible 15 metre high 18-armed statue of the Goddess of Mercy and Compassion, Guanyin. The many arms symbolise Guanyin’s ability to provide help to all, with each hand holding a different tool to assist. The temple is bursting with colour, from the gold detailing of Guanyin to the vibrant robes of the Chinese-style laughing Buddha and the glaring pinks of the lotus flowers, that the statues and buildings appear to float on. All of this colour is seen in double in the pond that the temple is built on and around; it’s a truly mesmerising sight. However, it is the Big Buddha located at the Wat Phra Yai temple that is certainly the most visited on the island. The golden 12 metre tall Buddha can be seen from several kilometres away, and is found on a small island that connects to the main island by means of an elevated causeway. It is even one of the first things many people see when arriving by air to Koh Samui! A colourful dragon-lined staircase leads to the Buddha, who sits in a pose of steadfast enlightenment, with a courtyard at the bottom that contains a small market of different foods, trinkets and souvenirs. The morning is the most lively and interesting time to visit the temple, as this is the time when you can observe the chanting of the monks and local devotees bringing their offerings. 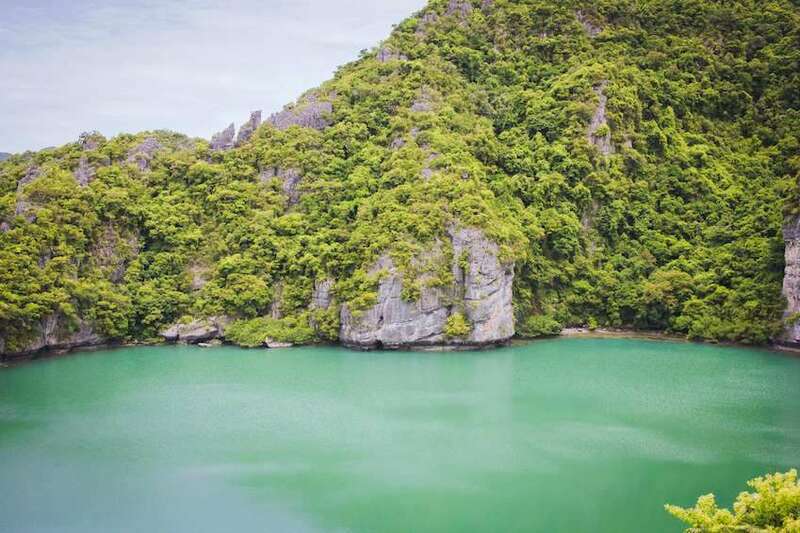 A protected archipelago made up of 42 islands, of which 41 are uninhabited, Mu Ko Ang Thong National Marine Park is utterly spellbinding in its natural beauty. Towering limestone mountains covered in green, protruding from an ocean of shifting turquoise tones, white sandy beaches, secret coves, waterfalls and expanses of mangrove forests...it’s a paradise for both humans and colourful terrestrial and marine wildlife alike. There are many different boat tours to reach the islands, where you then have options to kayak, snorkel and hike your way around the incredible landscape. Emerald Lake is the highlight for many people, which is of a stunning colour, enclosed in a rugged ring of lush green and limestone. Kayaking in particular is highly recommended to get up close to some of the caves that dot the archipelago. Snorkeling is also spectacular, as the park hosts hundreds of species of colourful coral and marine fauna. You are also likely to see the resident dusky leaf monkeys and crab-eating macaques as you hike around the islands to various viewpoints! Koh Samui is also a fantastic place to be staying to jump on a boat and head to world-renowned dive sites. The best visibility and conditions for diving are found between March and August, where many of the best dive sites are found in locations between Samui, Koh Tao and Koh Phangan. In particular, Sail Rock is known as one of the most exciting dive spots due to the whale sharks that are commonly seen here. Barracuda, batfish, colourful parrotfish, angel and butterflyfish are also here in abundance. To stay on land and enjoy a view of the horizon, head to the iconic and highly popular Woo Bar, which has a feeling of elegance in its sleek decor, the height of which is its seemingly-floating island booths with plush cushions, set into a pool. A curving wooden deck leads to these, with the ocean stretching out beyond the glass perimeter. Grab a cocktail and indulge in VIP luxury. Then head inland to get a real feel of the wilds of the tropics, following jungle paths to secluded waterfalls. The popular Na Muang is made up of two cascades; the first of which, and the largest, flows into a natural pool, and the second is another 30 minutes further uphill by foot. You can have a refreshing dip in both, surrounded by the natural forest noises. 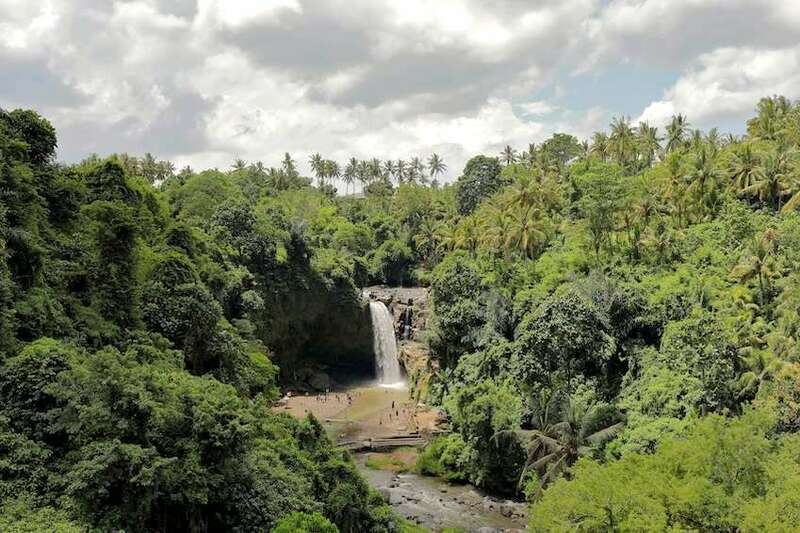 If you are confident with your feet, climb to the top of this waterfall for breathtaking views over the canopy! Na Muang means ‘Purple Waterfalls’, which is owing to the massive purple rocks that the water gently slides down. Wang Saotong and Hin Lad waterfalls are much less populated, as they require a 1km and 2km trek to reach them respectively, and this only adds to their appeal. Both are absolutely stunning, despite neither of them being particularly high. Instead it is the vibrant green environment in which they are situated, and the cooling reward for reaching them once you plunge into their pools, that makes it worth the trip. With so much to see, a luxurious and comfortable base is essential. At Villanovo, there are many stunning options of villas that cater exactly to your requirements. Whether it’s an infinity pool, tennis court, house staff and chef, gym, home cinema, games room, spa, direct access to the beach or incredible views over the island, there is a villa that will match and exceed your expectations. 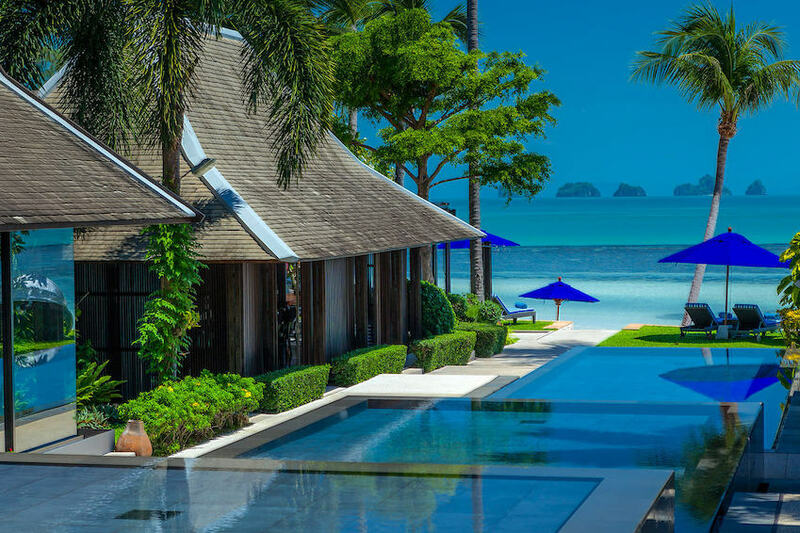 To complete your paradise getaway, explore our luxury villas in Koh Samui.